Tonights playlist has meaning behind it and a powerful message. 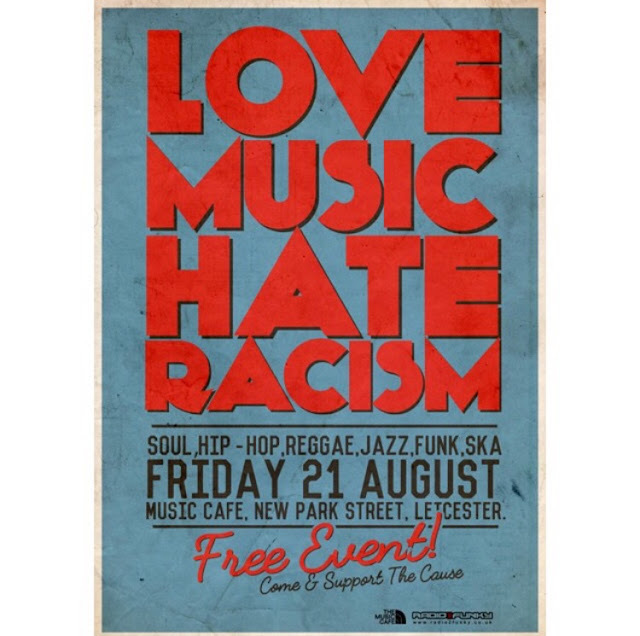 On Friday the 21st of August 2015, Music Cafe in Leicester are hosting an event called Love Music, Hate Racism. When the day comes i shall be at the event enjoying all the amazing live music and showing my support to the cause. I will be doing more of an in-depth blog post about the event the day after, allowing me to talk more about it. The playlist i have made for tonight is a mixture of genres that will be played at the event. I would like to say when making my playlists i am a very professional person, however the reality is that the reason it takes me ages to make them is because i constantly pause to jig about and enthusiastically dance. If you are planning to attend the Love Music, The Racism event hosted by Music Cafe (which i encourage many of you to), i would love for you to get in contact with me so you can share your thoughts on the event.